I enjoyed reading Dr. Gotts book. It explains why we should omit flour and sugar from our diet and the benefits we get from doing so. Dr. Gott’s No Flour, No Sugar Cookbook recipes include a wide variety from breakfast to desserts. My one criticism is the large amounts of artificial sweetener in many of the recipes. I would not use a lot of sweetener in the recipes myself, but I can understand why he included them in this book. I think this book could help us change our lives. Time and time again I have asked my doctor for a magic pill to help me lose weight. I have tried every diet on the market. I might lose weight short term but it always comes back -plus. Of course, we all know there is no magic pill; it takes will power, commitment, and a plan. In 2006, Dr. Peter H. Gott offered readers a plan to lose weight in his book Dr. Gott's No Flour, No Sugar Diet. His latest book offers inexpensive and delicious recipes to support his diet. Gott begins this book by answering question from his readers. One of the points I thought very important was to get rid of all flour and sugar products in your pantry. Another important point is to be prepared for special events. The Glycemic Index has always sounded confusing; however, Dr. Gott uses laymen's terms to explain it. Cooking is one of my hobbies so I was eager to try the recipes. The first one I tried was Spicy Scrambled Eggs. The eggs are delicious and healthy. The recipe makes just the right amount for two people. The next one I tried was the Orange Smoothie; it serves two and is delicious. As in most cookbooks, you will find some you love and some you will not. The Tasty Chicken Wraps were a hit but the Mediterranean Bean Wrap was not. This is a good cookbook. The recipes are simple and user-friendly. Rush out and buy this cookbook for a healthier life and delicious eating. This cookbook provides good recipes for healthy eating. As my husband and I are trying to cut down on white flour and sugar in our diets, I've used this cookbook several times to try new recipes. One recipe--for a spicy cornbread using corn meal and oatmeal is quite good, and I'll make it again. I wasn't sure if I needed both books about the no sugar no flour diet. This book gives you recipes as well as info on the actual diet. You can skip the first book and just get this one and be just as informed. 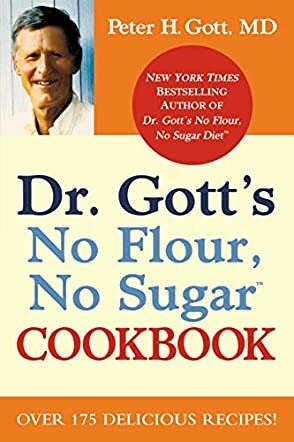 I give Dr. Gott great credit for popularizing the No Flour No Sugar concept. Those items alone are very responsible for making a lot of people dangerously overweight. I even refer my own readers to Dr. Gott's book as a great source of information. My weight loss and complete fitness book, Fat Into The Fire, talks about flour being the same as 'glue'. Add flour to sugar, and now you basically have sugar with sugar. Thanks Dr. Gott for increasing the awareness of how bad flour and sugar are for people. I have been on them all. This diet is very easy and the book is easy to read with recipes. I also purchased the recipe book and it is full of wonderful recipes. This is not an overnight weight loss. It comes off slower than others, but I am very happy with it and not at all hungry. My husband and I have been trying to lose weight for a long time. We bought both the No Flour, No Sugar Diet book and the No Flour, No Sugar Cookbook. We have been able to lose around 10 pounds each in around 2 weeks. The first book is clear to understand because is written in clear English, no medical mumbo-jumbo. The cookbook has inspired my husband to cook new recipes and I'm impressed, not only some of those recipes are true delicatessen, but also easy to prepare. The cookbook also has inspired us to create our own recipes, such as oatmeal crepes, they are delicious!. My son who is not on a diet ate two the other day and he never realized they weren't made of flour. The spaguetti squash is another discovery in that book. I'm a fan of spaghetti, and although the consistency of the spaghetti squash fibers is not exactly as real noodles, once we mix them with the sauce and meat, they just taste like some fancy special wheat spaguetti. My husband also has made some peanut butter from scratch and mixes it with oatmeal and splenda and they are a treat we eat sometimes. The only way to know how good this diet is, it is by starting. Now we are feeling ready to start to do some exercise. Before losing some weight was unthinkable for us. No sugar, no flour has improved my skin texture. My face has lost the 'puffy' look and I lost inches within two weeks on my arms and waist. I feel less lethargic as well. Also try Finger Licking Different, it has sugar optional recipes and also recipes without flour. I have read Dr. Gott's advice column for a number of years and find his advice to be very much in line with a common sense attitude in all areas. His approach to weight control is also in line with his medical advice. There are a number of excellent recipes and practical hints to achieve success. This cookbook has been very handy. I had read the book a year ago and tried to implement some of Dr. Gott's suggestions. However, being slightly cooking-impaired and lacking creativity things could get stale. I liked the variety of different foods, plus the fact that he suggests other things and making some things vegetarian (which half my family is). The pizza using rice for the crust is my personal favorite. Easy, crunchy, totally "outside the box". You really have to rethink label reading and deciding that creating foods for your family is worth the work. I have used many recipes and they are easy to modify to your own taste. This is a wonderful, easy diet to follow and this cookbook is a big help. I enjoyed making a couple of the recipes already. This is an excellent cookbook for those wanting to maintain a low weight or even loose weight. All of the recipes that we have tried have been delicious. We used a couple of the recipes for our Christmas dinner guests! All went back for seconds claiming the food was excellent.